I re-worked the Chewy Chocolate Gingerbread Cookies and I am pleased with the result. These didn’t spread as much but were still chewy. The dough was not as sticky and so could be scooped right away and then chilled. The mini chips worked well in the smaller cookie. I eliminated the baking soda/boiling water step which I don’t think added anything in the first place. I might add a little icing next time, but it is unnecessary. 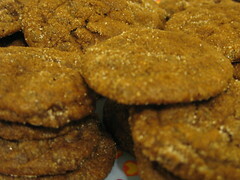 These are strongly ginger flavored, so if you don’t like ginger, these are not for you. They went over well at the party where I served them. 1. In a medium bowl, mix (sifting is optional) together flour, ground ginger, cinnamon, cloves, nutmeg, cocoa, and baking soda. 3. Beat in the flour mixture into butter mixture, half at a time. Mix in chocolate. 4. Scoop with a 2 tsp scoop and roll dough into balls, about 1 inch in diameter. Chill for at least 1 hour. 5. Heat oven to 325 degrees. Line three baking sheets with parchment. Roll cookie balls in granulated sugar; place 2 inches apart on baking sheets. Refrigerate 20 minutes. Bake until the surfaces crack slightly, 10 to 12 minutes. Let cool 5 minutes; transfer to a wire rack to cool completely.